85. 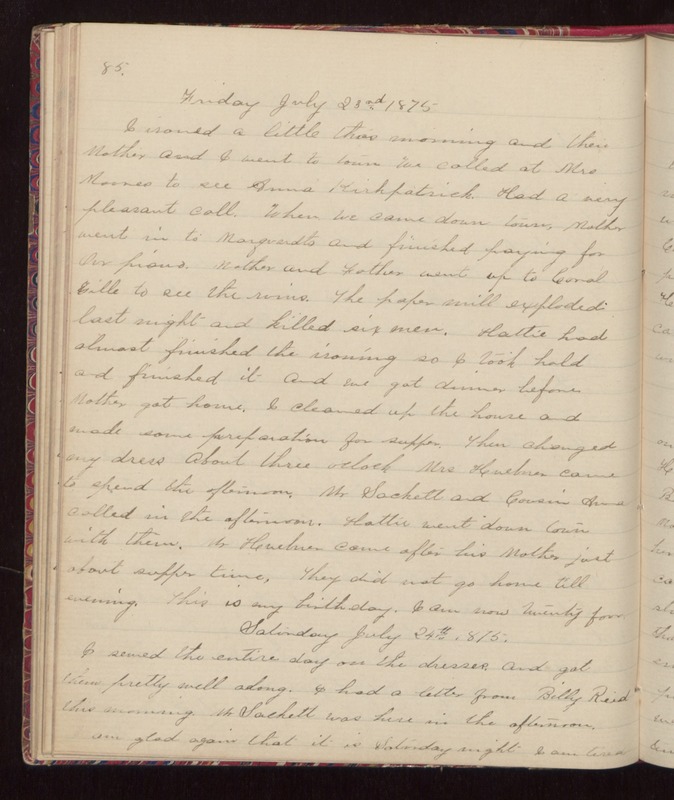 Friday July 23rd 1875 I ironed a litle this morning and then Mother and I went to town We called at Mrs Moores to see Anna Kirkpatrick. Had a very pleasant call. When we came down town, Mother went in to Marquardts and finished paying for our piano. Mother and Father went up to Coralville to see the ruins. The paper mill exploded last night and killed six men. Hattie had almost finished the ironing so I took hold and finished it and we got dinner before Mother got home. I cleaned up the house and made some preparation for supper. Then changed my dress About three oclock Mrs Huebner came to spend the afternoon. Mr Sackett and Cousin Anna called in the afternoon. Hattie went down town with them. Mr Huebner came after his Mother just about supper time. They did not go home till evening. This is my birthday. I am now twenty four. Saturday July 24th 1875. I sewed the entire day on the dresses, and got them pretty well along. I had a letter from Billy Reed this morning. Mr Sackett was here in the afternoon. I am glad again that it is Saturday night. I am tired.